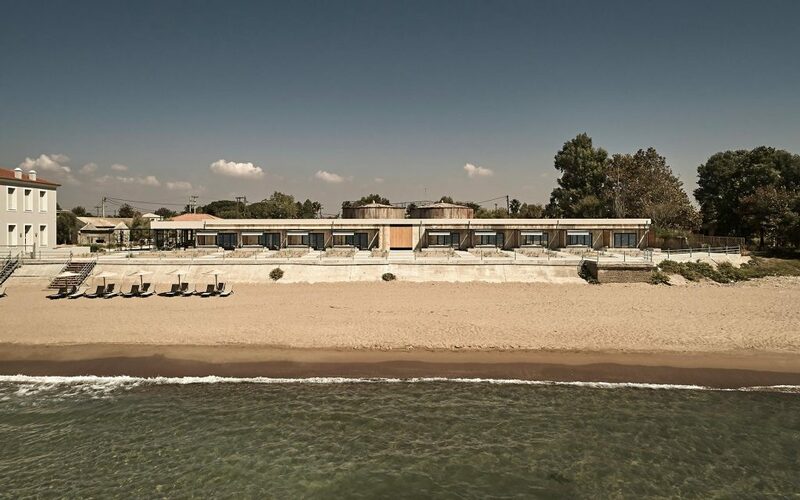 The Dexamenes Seaside Hotel has been adapted from an abandoned wine factory on the west coast of mainland Greece. Phase 1 is now complete and the hotel is open, phase 2 is planned for 2019. 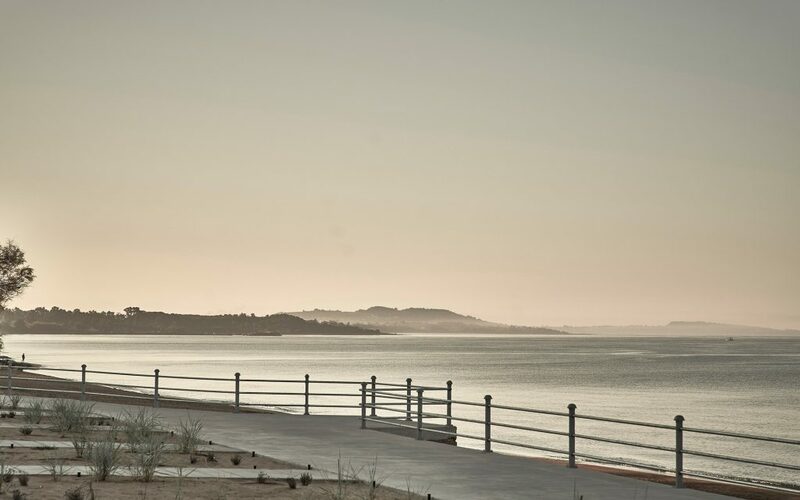 Dexamenes is located on the stretch of coastline in the western Peloponnese, an area with reportedly more wineries and grape varieties than any other region in Greece. Following the liberation of Greece in 1830, currants became the main export product of the Greek Kingdom. c1910 the trade of currants collapsed, resulting in a need to convert unsold stock into alternative products, such as wine. It was at this time that the region’s first wineries and distilleries were created. Ships were loaded with wine via pipes (built as a platform on the beach of Kourouta) to set sail for the major overseas markets. The hotel owner, Nikos Karaflos, described as an entrepreneur turned hotelier appointed highly regarded designers K-Studio to assist in creating his vision. Together they recognised the importance of preserving the original wine factory’s history and raw beauty. A material palette of concrete, steel, engineered glass and timber was selected to complement the existing structures. 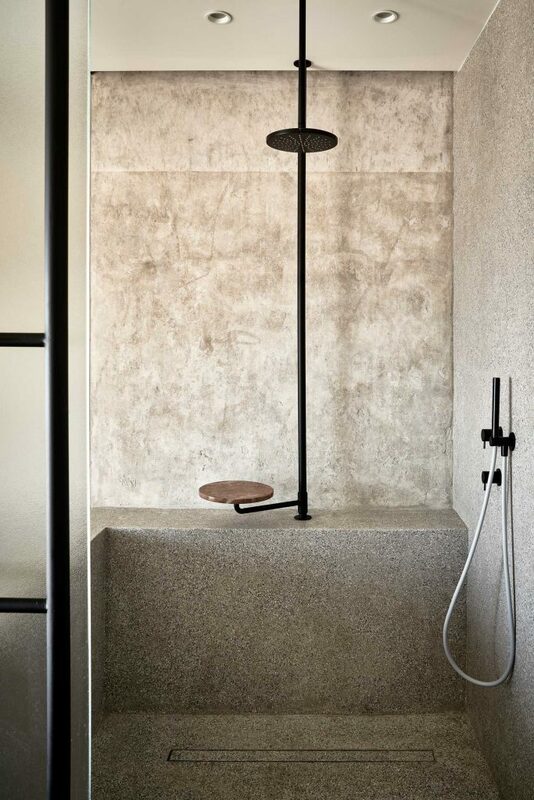 The gritty concrete walls of the bedrooms built within the old storage tanks are punctuated by black steel piping, with polished terrazzo bathrooms screened by textured glass and sliding windows framing impressive sea views. Phase 1 has seen the transformation of just 8 of the 40 tanks within the first of the 2 existing concrete blocks. Phase 2, planned for 2019, will continue to transform the first block to provide more rooms and facility spaces. A second steel-frame extension will be constructed at the end of the second block and a lush green vine-garden is planned to fill the space between the blocks. The adjacent existing buildings will be converted to house extra amenities such as a taverna, a boutique ‘bakaliko’ selling local produce, and a history room that will connect visitors to the story of the site.